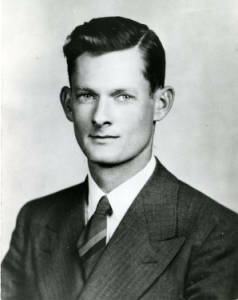 Pictured here years before his appointment as executive Director of Philadelphia Housing Association, Edmund Bacon is sometimes referred to as “The Father of Modern Philadelphia.” Born in the Philadelphia suburbs in 1910, he studied architecture at Cornell and introduced a plan for a new civic center for Philadelphia as part of his senior thesis. He was awarded a scholarship and continued his study at the Cranbrook Academy of Art in Bloomfield Hills, Michigan, later finding work in Flint, Michigan, before returning to Philadelphia and serving as executive director of the Philadelphia Housing Association. 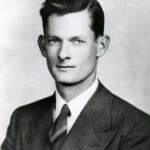 After serving in the United States Navy during WWII, Bacon joined the Philadelphia City Planning Commission and became the executive director of the committee in 1949. Earning a national reputation for excellence during the mid-century era of urban renewal, he was featured in Time and Life magazines and was appointed by President Lyndon Johnson to the White House's Conference on Recreation and Natural Beauty. As the bicentennial approached, Bacon proposed that Philadelphia host a world’s fair to coincide with the 1976 celebration. He envisioned a redevelopment of the city’s waterfronts, a midway closed to automobiles on Chestnut Street, and a tram that would take visitors over the Schuylkill River into Fairmount Park, site of the successful 1876 Centennial. However, due to political and financial disagreements, Bacon’s vision was never realized. The world’s fair idea was scrapped and on the national level, individual celebrations across the country were encouraged. Philadelphia did not become the international stage as Bacon had hoped. 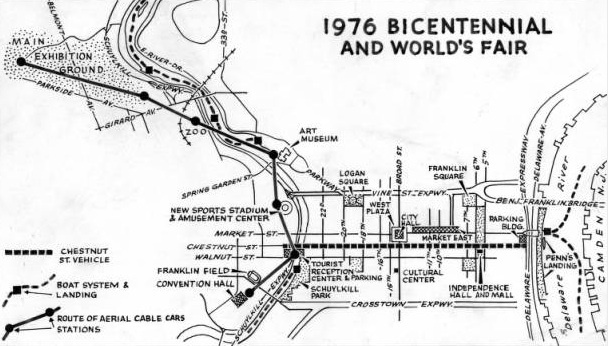 This map, from 1963, shows Ed Bacon’s original plan for the bicentennial celebration, merged with a world’s fair. The main exhibition grounds in Fairmount Park are in the northwest portion of the map, with a boat system and cable car route running along the Schuylkill River to transport visitors. Most of Bacon’s plans were not realized, including a Chestnut Street closed to traffic, running east to west through the center of the city. However, the Vine Street expressway was built in 1964 and Market East Station opened its doors in 1984. 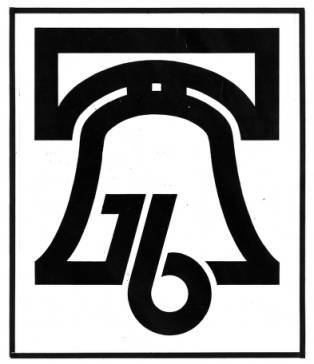 This outline of the Liberty Bell, with the number 76 visibly entwined, is one of the marketing symbols created for Bicentennial celebrations in Philadelphia. The bell was originally forged in 1751, the fiftieth anniversary of William Penn’s 1701 Charter of Privileges. It is largely associated with the Declaration of Independence, however, because it was described as ringing for that occasion in a short story published in the nineteenth century by Philadelphia novelist George Lippard. From that point onward, the Liberty Bell became ingrained in the public memory of the American Revolution, serving as a local symbol of Philadelphia and a larger symbol of national importance—an ideal symbol for the city’s Bicentennial celebration. 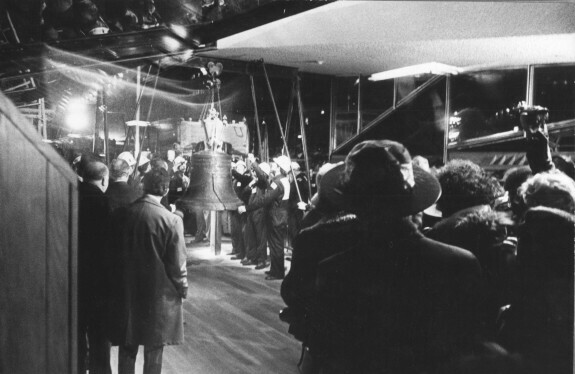 On New Year's Eve in 1976, the Liberty Bell moved to a new pavilion on Independence Mall, which created greater access for tourists but separated the icon from its historic home in Independence Hall. 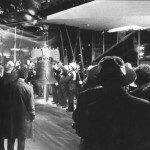 The bell moved once again in 2003 to a grander home, the Liberty Bell Center. Throughout the country, and especially in Philadelphia, feelings of nostalgia and patriotism soared as the country’s Bicentennial approached. The week leading up to July 4, 1976, was known as “Freedom Week,” and various celebrations took over the city. Protests also occurred in the city, as the July 4th Coalition and Rich Off Our Backs Coalition staged counter demonstrations in Fairmount and Norris Square parks. Pictured here is one celebration, a parade featuring children of all ages, dressed in patriotic outfits and performing for the many onlookers. Freedom Week included street fairs, parades, parties, the burying of a time capsule, and visits from well-known dignitaries and celebrities. President Gerald Ford (1913-2006), Pennsylvania Governor Milton Sharp (1912-1994), Queen Elizabeth II, Prince Phillip, and actor Charlton Heston (1923-2008) all helped to celebrate the nation’s birth. “Mazel Tov “ is a Hebrew expression, generally used to express congratulations or wish good luck. 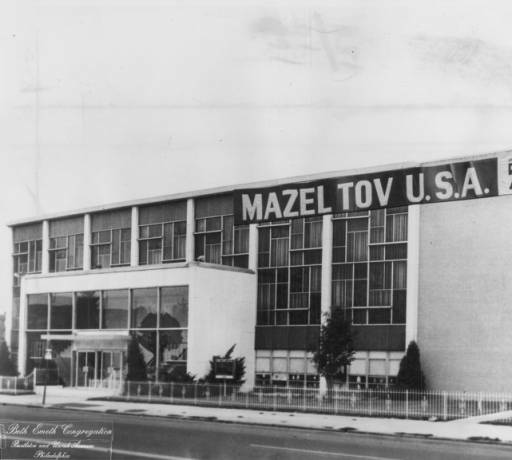 In this photograph, from September 1975, is of the Beth Emeth Congregation, located on Busleton Avenue in Northeast Philadelphia. This sign both congratulates the United States upon its two-hundredth birthday and wishes the country luck going forward, while simultaneously shining a light on the city’s Jewish population. 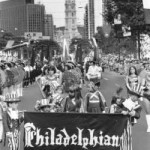 Planners of Philadelphia’s Bicentennial celebration in 1976, aware of the incredible success of the 1876 Centennial as well as the flop of the 1926 Sesquicentennial, hoped to showcase the growth and ambitions of the city while also commemorating the two-hundredth anniversary of the Declaration of Independence. 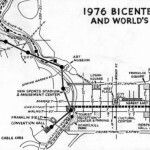 While the big celebrations drew crowds of Americans, the summer of ’76 also produced conflict and ultimately failed to fulfill the dreams of the city and its planners. In the early 1960s, more than a decade in advance of the event, city planning director Edmund Bacon initiated bold plans for a Bicentennial commemoration with an additional element: a world’s fair. He wanted to use the nation’s birthday and the international profile of the world’s fair—and the federal dollars these would bring—to advance the agenda of the Philadelphia City Planning Commission. Bacon imagined a thorough redevelopment of the waterfronts in Center City, as well as a “midway” concept that would close Chestnut Street to vehicles except for open-side electric streetcars. An overhead tram would move visitors across the Schuylkill to fairgrounds in Fairmount Park, the same location as the Centennial of 1876. In short order, however, the initial planning group and Bacon’s early vision were pushed aside by a vocal coalition of architects, planners, and reformers billing themselves as the “young professionals.” Including figures like attorney Stanhope Browne (b. 1931), editor Herbert Lipson (b. 1929), and architect Richard Saul Wurman (b. 1935), this group advocated a much grander concept, a model city built on a four-mile “megastructure” to be constructed above the Pennsylvania Railroad yard on the west bank of the Schuylkill. Meanwhile, planning also grew tense around the lack of inclusion of African Americans in the process. In response, the Bicentennial Corporation appointed Catherine Sue Leslie, a housing reform activist, to lead the “Agenda for Action.” This initiative aimed to include minority voices in Bicentennial planning, and Leslie developed a low-cost rival vision for the Bicentennial built around a scattered-site concept that would highlight the racial and ethnic diversity of Philadelphia. At the national level, in 1966 the Lyndon B. Johnson administration created the American Revolution Bicentennial Commission (ARBC), which was charged with making site recommendations as well as content and funding decisions. In Philadelphia, meanwhile, a Bicentennial Corporation was chartered in 1967 and began working to raise funds, gather public support, and elaborate the theme and design elements of the Bicentennial and world’s fair. Philadelphians also sought to gain a competitive edge over Boston, a rival for the celebrations. 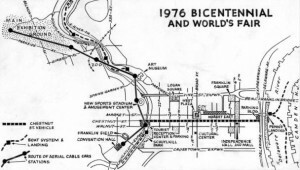 In 1969 a Philadelphia delegation presented the ARBC with its “Toward a Meaningful Bicentennial” plan, with the megastructure at the center and five different “core” areas in the city to demonstrate innovative ways to solve America’s urban problems. Anticipating an estimated 100 million visitors, the projected costs totaled more than a billion dollars. The ARBC rejected the plan, and in Philadelphia a bitter divide developed along racial lines over the thematic focus and the location. By 1972 progress was stalled, and Mayor Frank Rizzo (1920-91) canceled the world’s fair bid entirely, leaving only the Bicentennial commemoration to go forward. On the national level, the ARBC encouraged celebrations throughout the nation, not just in Philadelphia. A year packed with Bicentennial-themed events began on New Year’s Eve, 1976, as thousands came to Philadelphia to witness the Liberty Bell being moved from Independence Hall to a new pavilion on Independence Mall. From January through October daily events included activities such as puppet shows, street theater, and concerts. The city hosted the NCAA Final Four tournament as well as all-star games for professional baseball, basketball, and hockey. The week leading up to July 4 was named Freedom Week and featured even more daily celebrations, street parties, parades, picnics, and concerts. A 2076 time capsule was buried at Second and Chestnut Streets, a 50,000-pound Sara Lee birthday cake was served at Memorial Hall, and fireworks filled the sky throughout the week. On July 4, 1976, a ceremony on Independence Mall featured President Gerald Ford, Pennsylvania Governor Milton Shapp (1912-1994), and Philadelphia Mayor Frank Rizzo, with actor Charlton Heston as the master of ceremonies. Following the ceremony a five-hour parade featured floats from every state and 40,000 marchers. An estimated two million visitors came to Philadelphia to attend these events. On July 6, Queen Elizabeth II of Great Britain visited and, with Prince Philip, presented a Bicentennial Bell made in the same foundry as the original Liberty Bell. During the year-long celebration, Valley Forge, up to this time a state park, became Valley Forge National Historical Park. On July 3, the winter campsite of George Washington’s Continental Army served as final destination for a commemoration of the westward wagon treks of the nineteenth century. Six wagon trains totaling 200 wagons, which had traveled for months from all over the nation, converged in Valley Forge in front of a crowd of nearly a half a million people. Along with the patriotic events came counter-demonstrations. Two groups of Philadelphia citizens, the July 4th Coalition and Rich Off Our Backs Coalition, staged marches and demonstrations during Freedom Week to oppose the celebration. Their plans prompted Mayor Rizzo to request 15,000 federal troops to maintain order, a request that was denied. Despite Mayor Rizzo’s concerns, the demonstrations in Fairmount Park and Norris Square Park were peaceful. Philadelphia’s Bicentennial celebration concluded to mixed reviews. 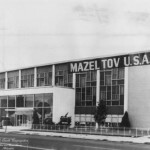 The event introduced many thousands of Americans to the urban renewal and historic preservation successes of the postwar period in the city. The three blocks composing Independence Mall were added to Independence National Historical Park in 1973, and historic buildings in the park were refurbished. The Afro-American Historical and Cultural Museum, now the African American Museum in Philadelphia, and the Mummers Museum both opened in 1976. The Port of History Museum on Penn’s Landing at Walnut Street was designed as a Bicentennial gift from the state to the city, but it did not open until 1981. The Society Hill neighborhood, Elfreth’s Alley, and Penn’s Landing were all popular sites during the celebration. While Freedom Week brought large crowds to Philadelphia, attendance at Philadelphia’s historical sites dropped quickly afterward. The total number of visitors to Philadelphia in 1976 was estimated to be between 14 and 20 million, which fell far short of the planners’ expectations. Much of the shortfall may be attributed to fear of violence spread by media attention to the protests and the mayor’s reaction to them. During the Bicentennial there was also an outbreak of Legionnaire’s Disease. Hundreds of members of the American Legion staying at the Bellevue Stratford Hotel contracted an infectious disease through the hotel’s air conditioning system, killing more than thirty of the Legionnaires. Despite Philadelphians’ initial visions for a transformative event, the planning price tag of more than $50 million may have been too high considering the lack of long-term benefits. Features that were meant to bring lasting value, like a Living History Center or the Chestnut Street Transitway, were considered a thorn in the city’s side just five years later. It would be hard to imagine a more challenging period of time—with civil rights struggles, the Vietnam War, and Watergate fresh in mind, and the effects of racial strife, white flight, crime, and deindustrialization apparent in American cities—to hold a patriotic celebration. Philadelphia could not alter the calendar or reshape the larger context of the Bicentennial year. Madison Eggert-Crowe is a graduate of Drexel University (2010) and is pursuing her Master’s in Public Administration at University of Pennsylvania’s Fels Institute of Government. Scott Gabriel Knowles is associate professor of history at Drexel University. He is the author of The Disaster Experts: Mastering Risk in Modern America (2011) and Imagining Philadelphia: Edmund Bacon and the Future of the City (2009). Scott Gabriel Knowles, ed. Imagining Philadelphia. Philadelphia: University of Pennsylvania Press, 2009. Philadelphia 1976 Bicentennial Corporation, Toward a Meaningful Bicentennial, 1969. “The Big 200th Bash,” Time, July 5, 1976): 10. “The Philadelphia Killer,” Time, August 16, 1976. Architectural Archives of the University of Pennsylvania, 220 S. Thirty-Fourth Street, Philadelphia. Records of Civic Celebrations, Philadelphia City Archives, 3101 Market Street, Philadelphia. Urban Archives, Special Collections Research Center, Temple University Paley Library, 1210 Polett Walk, Philadelphia. Bellevue-Stratford Hotel (Hyatt at the Bellevue), 200 S. Broad Street, Philadelphia. Independence National Historical Park, Fifth and Chestnut Streets, Philadelphia. Independence Seaport Museum (original Port of History Museum), 211 S. Christopher Columbus Boulevard, Philadelphia. Valley Forge National Historical Park, King of Prussia, Pa.
Philadelphia’s original bicentennial planning corporation was known as the Philadelphia 1976 Bicentennial Corporation. As the essay states, it did plan for an elaborate world’s fair in Philadelphia in 1976. Richard Nixon’s decision not to allow the federal government to support one grand event but to support events throughout the United States brought the 1976 Bicentennial Corporation to a quick death in 1972. From its ashes rose a small group known as the Bicentennial Planning Group. This group submitted its report to the Mayor and administration in early 1973. 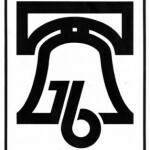 Philadelphia ’76, Inc. was organized to bring many of the ideas of the Bicentennial Planning Group to life. These ideas included some capital construction, which centered around what was originally called the Afro-American Museum and the Living History Center, as well as funding neighborhood celebrations throughout the city. 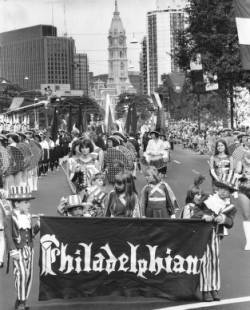 Events were sponsored by Philadelphia ’76, Inc. in late 1974 to commemorate the 200th anniversary of the First Continental Congress. In May 1975, another commemoration occurred on the Parkway for the bicentennial of the opening of the Second Continental Congress. As part of this celebration, international flags were first hung along the Parkway and remain a vibrate part of the Parkway today. Not only were the two museums opened in 1975-1976, the celebration had two loci during the year: the Independence Mall area and the Parkway. “Bank Row” (421-431 Chestnut Street) was used for the Salute to the States exhibits, most of which were traveling exhibitions from each state. Independence Mall from Market to Arch Streets was home to the open-air theatre, in which professional performances of “1776” were presented, as well as other events. The Parkway was home to many celebrations of Philadelphia and the nation’s ethnic cultures during the year. The reality that was 1976 did not live up to the anticipation of an 1876 event in which Philadelphia would be the focus of the country’s celebrations. Perhaps the “Bell Moves at Midnight” event on December 31, 1975/January 1, 1976 was an augury: heavy cold rain poured throughout the event and by sun-up, there were six inches of snow on the ground. Many potential visitors may have been scared away by the possibility of the use of the National Guard. And the July 4th parade could have been managed better – there was little coordination between the organizers and the police who kept stopping the parade to let traffic cross Market Street. This definitely extended the time length of the parade. Generally, much of the Bicentennial did proceed without major problems and Philadelphia suffered some black eyes and bad press that was not deserved. The Bicentennial groups set out to entertain America at the Bicentennial and in this it succeeded quite well. Freedom Week, the city’s annual celebration of America’s birthday, is indeed a true descendant of the Bicentennial. We visited Philadelphia during late June, 1976. We visited many exhibits and historical places while there. One center we visited, began with a historical video of horses running and jumping a fence. Although this description is vague, we have since tried to find this “film” on YouTube and the internet to no avail. The film was very well done, and made the viewer feel as if we were right there watching in person. Again, this isn’t much information, but was wondering if someone might recollect this well done film about Philadelphia. Thank you. Your time in this matter is greatly appreciated.